TheAquarium of Livorno, only a little more than 50km from our guesthouse, is the biggest aquarium in Tuscany and is situated along thecoast of Livorno , in an enchanting landscape of great historical and archaeological significance, on the inside of Mascagni Terrace, one of the most elegant and evocative places in the city. The value of the structure is intertwined with important characteristics of the land on which it stands, in fact, the Etruscan coast meets the Tuscan archipelago and the whale sanctuary creating an extraordinary blend of sea, nature and archeology. 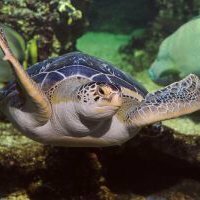 Visitors of the aquarium can admire approximately 1.700 animals of 300 different species, among which stands out the green turtle “Cuba”, a true star of the aquarium, the fish Napoleon, the black-finned sharks, coral and many other marvelous specimens. The aquarium has different areas inside, some of which are of particular interest: the Diacinto Cestoni hall – “The pearls of the Mediterranean”, with 12 tanks dedicated to the beauties of the Mediterranean sea; the Mediterranean area with its tactile tanks, where people can experience the true emotions of caressing different breeds, and the Greek-Roman Archeological Marine Area,a large tank containing the reproduction of a Roman shipwreck. For further information visit the official website of the Aquarium of Livorno.